I am encouraging you to take heart! Currently, Ms. Tatum is now resting. But, in the very near future, she will be raised---resurrected---to the prospect of living here, on earth—FOREVER! This is a PROMISE from our Creator, HIMSELF! Isn’t that wonderful, good news? I hope these words of encouragement have done for you what I have intended for them to do. And, that is, to provide you with some comfort, peace, and strength. Condolence: Betty is a beautiful soul who is now at home with Jesus. We are praying for Charlie, the love of her life, and for the family she loved so deeply and was so proud of. 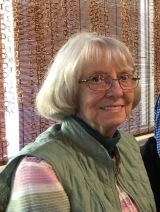 She was a beloved member of the Jimmy Moore Sunday School class and will be missed by us all.